How Many of These Do You Have in Your Bathroom? 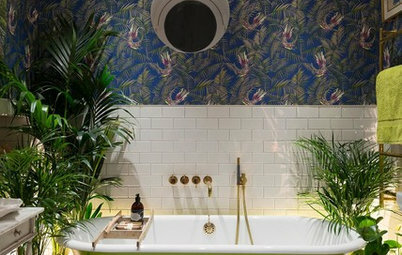 What are the 10 Golden Rules of Bathroom Design? We noticed these washspace trends coming through strongly in 2017 – have you embraced any of them in your home? Houzz UK Editorial Staff. I'm a journalist with more than 13 years' experience in publishing, and have worked on a wide range of magazines and websites. 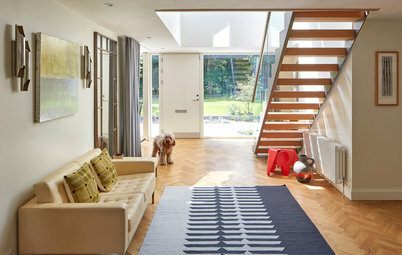 I'm passionate about interiors, so I'm proud and delighted to be part of the Houzz team. 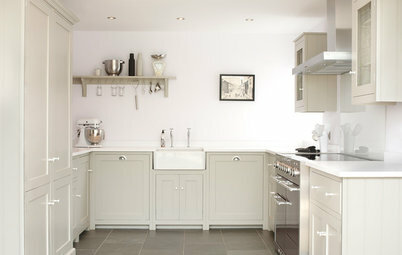 Take a look at these features and finishes we’ve seen a lot of on Houzz recently. Have any of them popped up in your bathroom, and are there any trends you think we’ve missed? Also see How Many of These Do You Have in Your Living Room? There are so many different tile finishes on the market that it’s possible to recreate almost any look on your walls and floors. One tile finish that works particularly well in the bathroom is faux wood. Porcelain tiles that resemble timber floorboards are a great way to get the look of a wooden floor without the risk they’ll get damp, and consequently rot. Hunt around: there’s a variety of wood types, finishes and sizes available, so you should be able to find the perfect match for your bathroom. 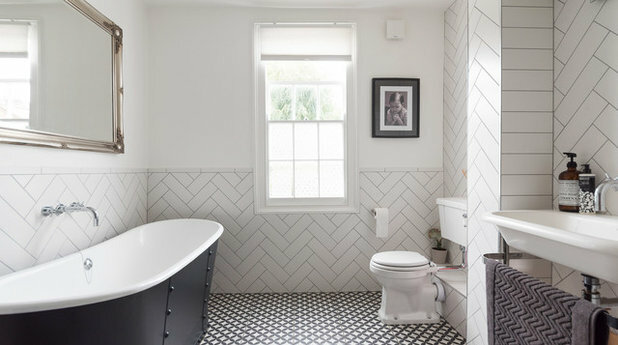 We’re loving geometric pattern all over the home at the moment, and the bathroom is the ideal place to go to town with it. 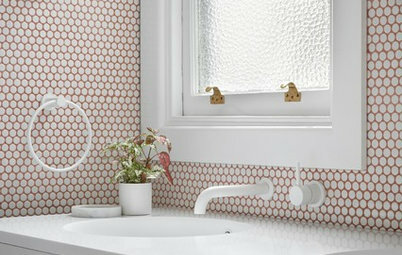 Arranging tiles in unusual layouts or sourcing striking designs are good ways to add interest to your washspace. Here, the owners have combined a diagonal check floor with white tiles laid in a chevron pattern. The clashing layouts work because the lines follow the same directions. Here’s another example of geometrics, this time on just one surface and with more colour. 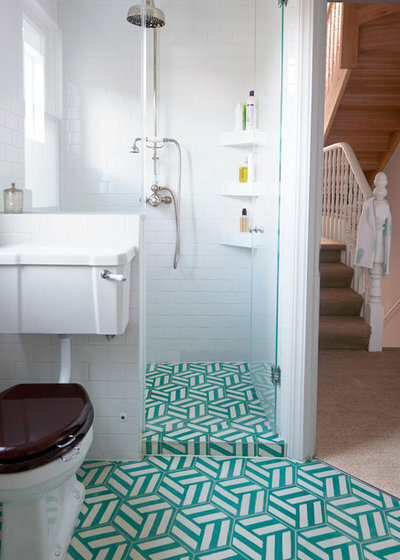 Feature floors like this are popping up in many bathrooms, and the geometric designs are a move away from the patchwork tiles we were seeing previously. Chrome isn’t the only way to go when it comes to fixtures and fittings. 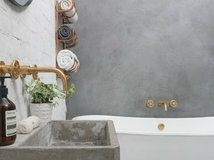 If you’re after a warmer look in your bathroom, try brass instead. 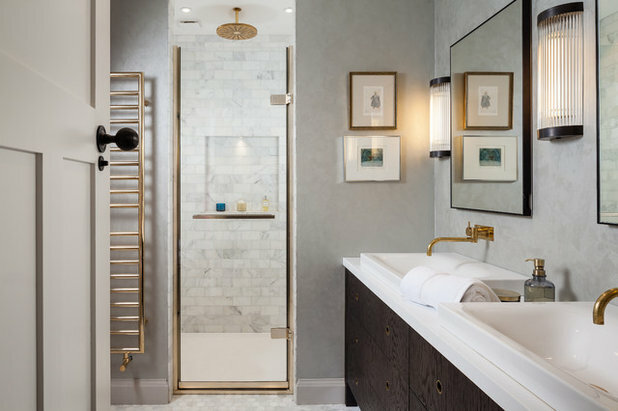 In this stylish scheme, the tap, towel radiator and shower fittings are all made from the gold-toned metal to give the room an on-trend look. The old-fashioned feel of brass is reminiscent of Art Deco’s luxurious style, so it’s great teamed with marble finishes and sleek-lined furniture and accessories. Don’t fancy brass? You could plump for black fittings instead. Metal taps that have been powder-coated in a matt black finish are available from a number of bathroom retailers. 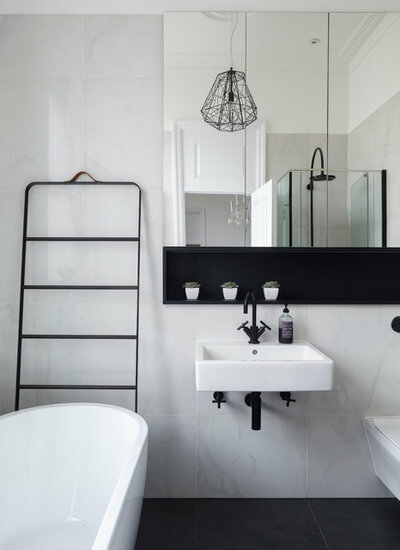 The tap and shower head here complement the black elsewhere in the room and give a striking contrast to the bright white sanitaryware and marble walls. 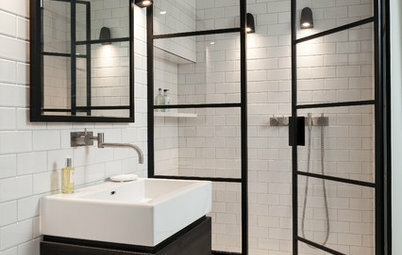 Black is finding its way onto shower doors as well, with the factory-style look that’s popular in other areas of the home being replicated in the bathroom. 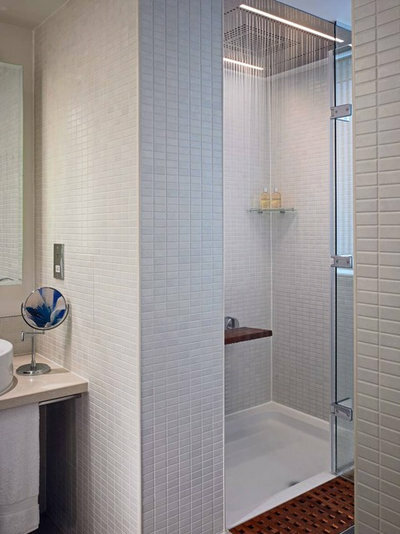 The opening here resembles French windows and gives the shower area a smart and contemporary feel. 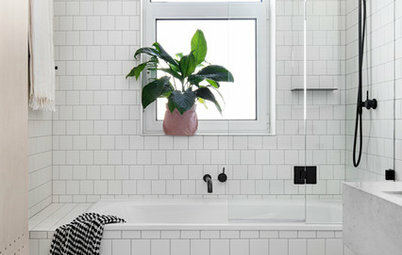 One material that’s been a particular favourite in the past year is marble, and we’ve seen it popping up frequently on bathroom walls, floors and basins. 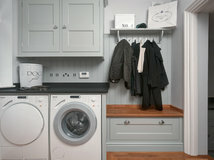 It adds an instant luxurious feel to a washspace and is subtle enough to go with most other finishes. 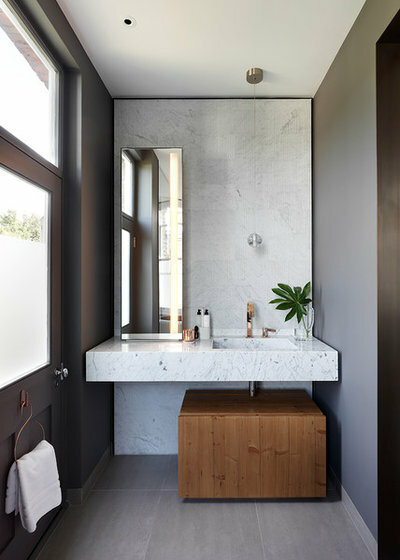 Here, the vanity unit, basin and wall form a feature area of marble that tones beautifully with the warm wood and deep grey. Homeowners are embracing nature in all rooms of the home, and the bathroom is no exception. 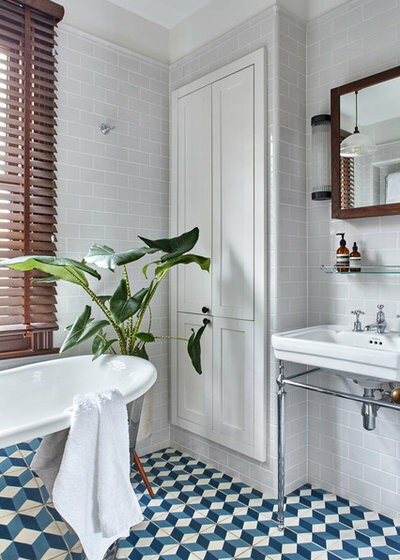 Wooden furniture and accessories, rattan baskets and luscious houseplants are all great additions to a washspace. 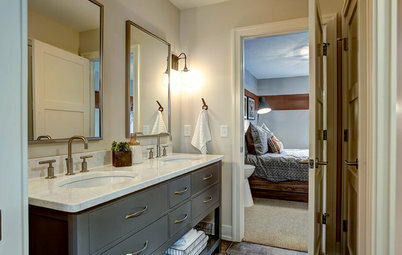 Natural elements in the bathroom help to give it a calm feel and create a spa-like sanctuary. 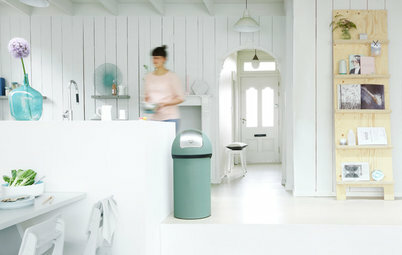 If you’re trying to think of ways to conceal your basin’s bottle trap, it might be worth ditching the idea altogether. 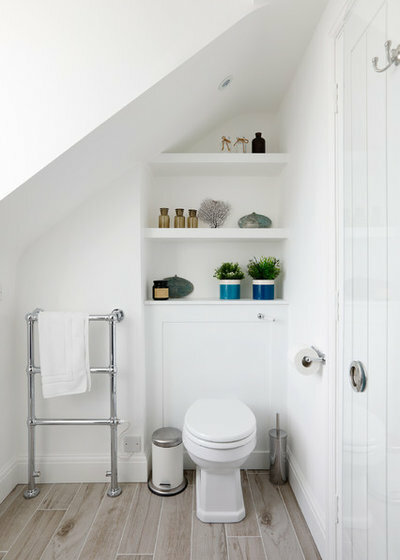 We’ve seen quite a few basins on Houzz that show off this crucial piece of plumbing, rather than hiding it – and why not if it looks as good as this one? The key is to choose a bottle trap in the same finish as your tapware to make it look considered rather than accidental. Also, think about where you’ll put your clutter. By losing under-sink cabinet space, you might need to up your storage game elsewhere in the room. 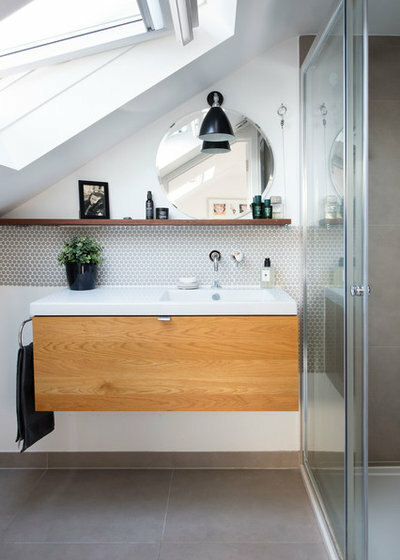 Practicality is key in the bathroom and that’s why floating furniture is such a good option. 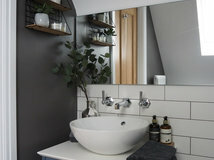 A wall-hung vanity unit makes it so much easier to clean the floor underneath and boosts the feeling of space in the room. The wooden number in this scheme fits perfectly into the small area, allowing easy access to the area below and giving the room a feeling of flow. If you want to instantly update your washspace, one of the best ways to do it is simply to hang a circular mirror. 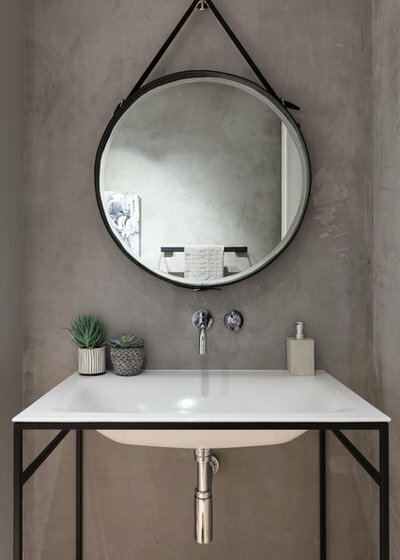 A pleasingly curved design with a neat frame and hanging strap will transform a tired basin area into a space that looks stylish and on-trend. The mirror in this bathroom works well with the hexagonal tiles as the hanging strap replicates the diagonal lines, while the circular shape contrasts with the straight edges of the hexagons. Fixed shower heads that disperse water like rain are the fitting of choice at the moment. It makes sense to have a large design that provides plenty of water, rather than a smaller, handheld model that targets just one area. How big you go depends on your preference and budget, so if you want real indulgence, choose a model like this one, which covers the whole ceiling of the shower enclosure. Alternatively, choose a more traditional-style design that covers the circumference of your head. Also do research which designs use the most and the least water – there are some smart eco innovations out there worth exploring. Do you have any of these features in your own bathroom – and have you noticed any other trends over the past year? Share your thoughts and ideas in the Comments section. Re the use of LVT, saying that they are not advised because the floor is not level. Surely you would always use self levelling floor screed on solid floors to correct the problem and leaves a perfect surface for them...we had Amtico tiles laid professionally and it was perfect. On boarded floors then a ply or even hardboard cover over them would be needed every time. Ask a professional LVT installer rather than a builder if you want the job done properly. Our guys did use the ply on the floor even with tiles. Filled in the gaps in original wooden flooring just today. Underfloor heating in tomorrow with latex I believe and the lovely grey oak tiles on top. Our builders gave us masses of invaluable advice and great ideas on the rest of the house and everything worked out. I have no reason to question their advice and experience. Most Popular How Can I Make my Bathroom Feel Like a Spa? Most Popular Are You Making These 7 Design Mistakes in Your Hall? Bathroom Planning Ask an Expert: What Do I Need to Know When Choosing a Shower Enclosure? 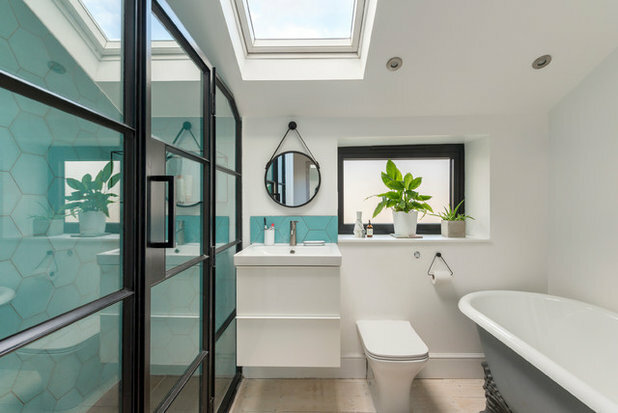 Boost your bathroom and splash out on a new shower enclosure – but which doors, where to position it and what’s best for small spaces?